The British Library who earlier this year gave us a handsomely designed facsimile reprint of The Notting Hill Mystery have matched their efforts with a second forgotten cornerstone in the history of detective fiction. 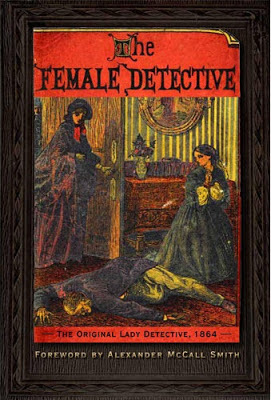 An informative introductory essay by Mike Ashley traces the authorship of The Female Detective, credited to the pseudonym "Andrew Forrester," to James Redding Ware (1832 – c.1909) and puts this fascinating series of short stories and novellas into the context of the policeman's casebook style of fiction popular in the early 1860s that would later develop into stories and novels about consulting and amateur detectives. Ware's stories dare to cast in the lead role a woman undercover police officer (yes, such a person existed in the mid 19th century) who shows she is made of tougher and smarter stuff than the buffoons and doltish coppers she encounters in her line of work. Not all of the stories feature the anonymous G___ , who often goes by the nom de guerre Miss Gladden. She at times steps aside to relate a second hand account of a mystery solved by the physician Y___, one of her colleagues in crime fighting, or Hardal "the most eccentric barrister who ever donned a stuff gown and a wig" who resembles in many ways the kind of genius consulting detectives that would soon flood the pages of The Strand in the tales of Conan Doyle, L.T. Mead, Arthur Morrison and others. When she is on her own, however, in the longest of the two stories Ware's skills as a detective story writer as at their best. Who knew that as early as 1864 there were fictional writers detailing 19th century scientific investigative techniques that would foreshadow the high tech forensic police work that has become standard in any work of crime fiction? Miss Gladden (as I will refer to our anonymous lead) not only makes use of her wily feminine interviewing talents, but is well versed in such varied fields as anatomy, criminal psychology, and Victorian law all of which she makes use of in ferreting out the culprits and their unusual reasons for committing their crimes. "Tenant for Life" is the first story -- really closer to a novella at more than 90 pages -- in the volume. A chance remark from a cabman and his wife leads Miss Gladden to the family at Shirley House. They may have gone to great lengths to preserve an inherited fortune. But was the stunt involving the switching of children really entirely criminal? Catherine Shedleigh and her brother turn out to be good and decent people though they have perpetuated what amounts to legal fraud in the eyes of the law and Miss Gladden. She is torn between feeling sympathy for the brother and sister and doing her duty as a policewoman. In fact, doing one's duty is at the heart of this particular story. Miss Gladden is constantly referring to the necessity of the detective in society. She believes they exist to bring about justice. This need for justice guides Miss Gladden first and foremost and leads her to inform on the Shedleighs despite their decency and goodness to which she is greatly attracted. Only later when the truth behind the Shedleighs' fraud is revealed will she subvert the law in order to protect them and punish someone else she sees to be more guilty, both legally and morally. In "The Unraveled Mystery" we see a more scientific approach to crime solving. Miss Gladden recounts a past crime involving a dismembered body left in a carpet bag beneath a bridge. It turns out to be Miss Gladden's cold case having left the police baffled who filed it as unsolved. She displays a virtuoso performance in tandem with her physician cohort Y___. Together the two combine their talents and devise an entirely plausible solution to how and why the crime was done, what specific weapon was used, who the victim was, and most astonishing of all where he most likely lived. She derides the routine police methods that often trap and hinder genuine police work. The point driven home in this exercise of detection is "that more intellect should be infused into the operation of the police system." She would rather have imaginative thinkers on the police force than the brutish, nearly illiterate dullards she almost always must deal with. Less a tale of detection than a morality lesson is "The Judgment of Conscience." Here is another example of Miss Gladden's observations of how crime is done for "noble" reason as as was first hinted at in "Tenant for Life." In this tale a man intent on murder confesses to a crime committed by another and nearly ends up hanged for it. Miss Gladden's insistence that ballistics evidence be examined saves him from the executioner's rope. There is also "A Child Found Dead - Murder or No Murder?" inspired by the Road Hill Tragedy better known to students of true crime history as the Constance Kent case. An imaginative but unconvincing argument for a sleepwalking killer being responsible is presented in a second hand account. The solution is founded upon Victorian law and the legal definition of murder. Hardal, the detective in the story is also a lawyer, and he is more concerned with fitting the circumstances of the crime to the legal reasons that constitute murder. Too rigid regarding legalities Hardal dismisses or overlooks the complex human emotions at the root of the murder of the boy which turned out to be a sort of juvenile version of a crime of passion as we know now. The best story in the volume -- one that had been previously collected in an anthology of Victorian detective novels by E.F. Bleiler for Dover Books -- is "The Unknown Weapon." Closer to a short novel (it runs to just under 100 pages) it is a rich and fascinating story of the mysterious murder of a squire's son told from the point of the discovery of the body to the involved coroner's inquest and ending in Miss Gladden's personal investigation and solution of the crime. In this tale more than any other we get Ware's satiric side and his sense of humor. There is a parade of gossipy country servants, a nervous Nellie of a maid who can barely speak the language and is prone to "conniption fits", and one of the stupidest police officers in all of Victorian fiction. An abundant use of country and lower class dialects is on display in the numerous interrogation scenes Miss Gladden conducts; her interpretative skills are taxed to their limit. Numerous parenthetical translations of the simplest words -- Yoa is yes, Whoa is what, for example -- are peppered throughout the story in a wry manner. The Female Detective is a very welcome addition to the ever continuing evolution of the detective novel as we know it. As more and more of these early texts are uncovered it is becoming clear to me that some of the most modern works of crime fiction came to us from overlooked writers in the earliest part of the 19th century. Ware's book proves that it can hold its own against modern technical forensic thrillers, psychological suspense, and the intense legal and police procedurals that make up the bulk of contemporary crime fiction. 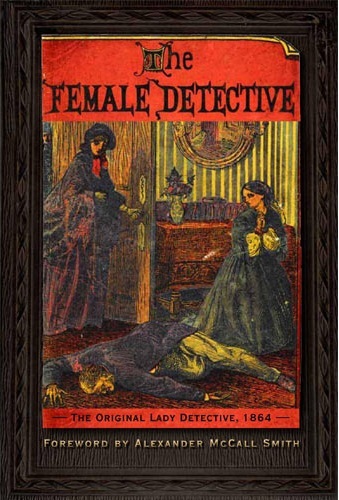 In many cases the subtleties of the characters' motives and the uncharacteristic and surprising vagaries of criminal behavior explored at the hands of a woman detective in the Victorian era are much more interesting to me than similar themes that have practically become commonplace in contemporary crime fiction. Elizabeth Foxwell also covers this today on her blog THE BUNBURYIST and mentions that it is also reprinted with REVELATIONS OF A LADY DETECTIVE (1864) in a single volume from Scholars' Facsimile and Reprints. Both are worth looking into. This sounds like an absolutely essential purchase John - thanks very much indeed. This sounds really interesting. I will check out our libraries. I am with Patti. Very interesting but am doubtful whether it will be there in the libraries that I frequent. This is the second time this has come up this week. I just found out that one of our Professors is teaching a course on the detective novel from Victorian to Modern times and this is one of the required books! I'm really tempted to disappear from my desk in the main office next semester and sit in on his class. Now that I've read your review, I'm going to have to get hold of this book stat. Terrific choice, John. I enjoy reading early detective/mystery fiction especially where the detective is a woman. The internet has many copyright-free fascinating books from the 19th to the early part of the 20th century. I'm going to check this out.